New Native Theatre performs the first all Native American musical to In the Heart of the Beast Puppet and Mask Theatre. 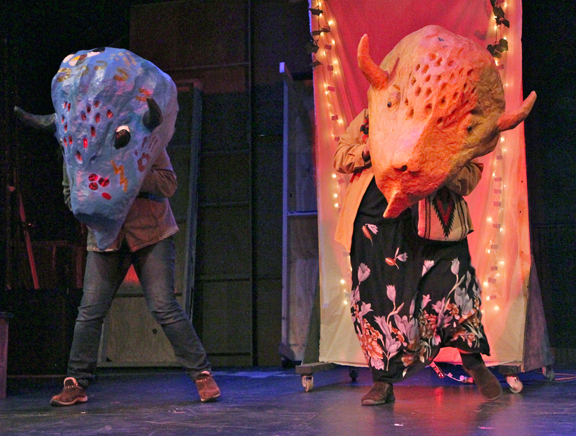 The show, co-produced with Bedlam Theatre, is a comical romp inspired by the hoopla surrounding the end of the Mayan calendar. 2012: The Musical! celebrates the Native sense of humor and looks toward the future. The show is a locally grown production, with the story taking place on Franklin Ave.
At the Heart of the Beast Puppet & Mask Theatre, 1500 E. Lake St., Minneapolis. Previews: Nov. 7 and 8 at 7:30 pm. Opening night: Nov. 9 at 7:30 pm. Other showtimes: Nov. 10, 14, 15, 16 and 17 at 7:30 pm; Nov. 14, 15 at 10:00 am; and Nov. 11, 18 at 3:00 pm. All tickets $15, $12 group discount, no one turned away for lack of funds. 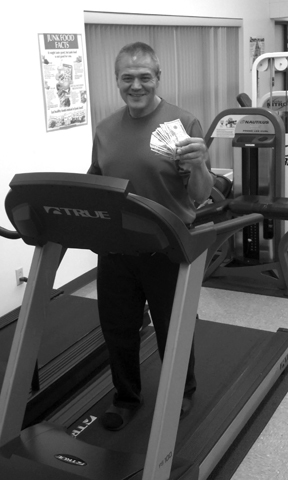 The Native American Community Clinic and Running Wolf Fitness Center, along with UCare sponsor, just wrapped up the 2012 Weight Loss Challenge. In all, 425 pounds were dropped by this year’s participants. The grand prize winner was Joseph Bester who lost 12.04% of his body weight over the course of the 12 week competition. Second place went to Billy Cooper who lost 11.40% of his weight. The top two winners received $500 and $100 cash prizes. The top 5 winners lost between 10.03% and 12.04% of their body weight. Many of the top "losers" were seen working out regularly at Running Wolf Fitness Center during the course of the 12 week challenge. Three month memberships to the gym were given to participants for free as part of the challenge. Participants were encouraged to keep daily food journals to track their diet and meet with the dietitian at NACC to set new goals and receive support and guidance in sticking to their weight loss plan. The Minnesota Historical Society has launched a unique, comprehensive website enriched with video, audio and interactive tools to illuminate a important time in Minnesota and U.S. history, the U.S.-Dakota War of 1862. The site, www.usdakotawar.org, is designed for teachers, students, researchers and everybody interested in the broader national causes of the war, the war itself and its far-reaching consequences. The website reveals stories of survival, resilience and healing and it uses primary sources, oral histories, maps, multiple perspectives and interactives to tell the history of the war, its causes and its aftermath. The public is invited to join discussions and also to post their family history related to the war in the "Share Your Story" section of the website. In this final phase of the website, visitors learn about the Dakota homeland, newcomers to Minnesota, treaties, the war and it’s aftermath and today’s Dakota nation. Metropolitan State University was recently awarded a grant from the Minnesota Indian Affairs Council for $62,645. The grant is awarded to the University’s Dakota and Ojibwe Language Revitalization Initiative. The University’s College of Arts and Sciences, the Institute for Community Engagement and Scholarship, and the Student Affairs Office will use these funds to help preserve the Indigenous Dakota and Ojibwe languages and cultures by increasing the number of people who are conversant in these languages, building bridges to the American Indian community and making Metropolitan State more visible as a higher education option for American Indians in the Twin Cities. Additional project elements include the development of innovative summer immersion-model classes for adult students and community members, integrating knowledge of the culture as it is carried in the language; and concurrent youth classes for children who are relatives of adults taking the summer immersion classes, which provides an opportunity for cross-generational learning within families. Minneapolis, MN?- Leonard "Lenny" Fineday was elected President of the Minnesota American Indian Bar Association (MAIBA) on September 8 at the group’s annual meeting. 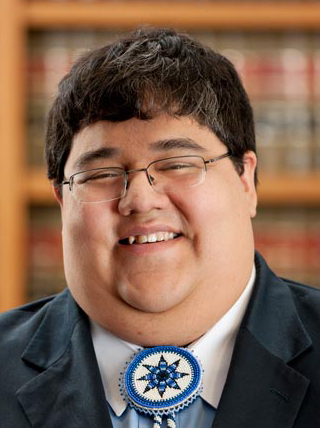 Fineday (Leech Band of Ojibwe) is an associate in Best & Flanagan’s Native American and Business Law practice groups. Fineday represents tribes and their entities in financial transactions, as well as assisting tribal governments in the areas of economic development, corporate governance, and statutory and code drafting. He is currently in his second year of a two-year term on the MAIBA Board of Directors and was recently re-appointed as a MAIBA Delegate to the Minnesota State Bar Association General Assembly. In addition to Lenny, the following individuals were also elected as MAIBA Executive Officers: Professor Mary Jo Hunter from Hamline Law School was elected Vice President; Leah Sixkiller from Faegre Baker Daniels LLP was elected Secretary; and Susan Allen from Fredericks, Peebles & Morgan LLP was re-elected Treasurer.